"When we go above and beyond the call of duty, we inspire others to do the same." Auxiliary officers of the Toronto Police Service come from all backgrounds and walks of life, reflecting the diverse community here in Toronto. 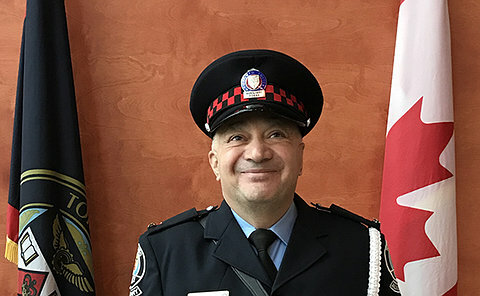 Auxiliary Constable Enzo Caluori, of Traffic Services Division (TSV), an 18-year veteran of the Toronto Police Auxilary program, brings with him 33 years of experience in the trucking industry. It can be said that he has found his niche at TSV. When told he had been nominated as the Auxiliary Officer of the Month for December, he felt humbled and honoured, and very surprised. "TSV's Auxiliary program is still very new and we are happy to have officers like Enzo who never hesitated to jump in with both feet as soon as he arrived at TSV," Constable Giancarlo Marelli said. Sergeant Brett Moore nominated Caluori for the award. "In Enzo's short time here at TSV, he has proven to be dedicated, reliable, enthusiastic and a valuable part of our team," Moore said. "Every time a detail gets posted for our Auxiliary officers, Enzo has always been the first to sign up." He has built many relationships especially with the officers at TSV, and is welcomed by D Platoon as a member of the police family. In recognition of his dedication, Enzo was presented with a framed certificate, a gift card and TPS memorabilia on December 21, 2018 by Sergeant Sheila Richardson, who is the Auxiliary Program Coordinator with responsibility for the 411 Auxiliary members. "These monthly awards are just one of the ways our unit is trying to encourage and motivate our Auxiliary officers<' Community Partnerships & Engagement Unit A/Supt. Dave Rydzik said. The uniformed auxiliary officers volunteer approximately 70,000 hours annually to assist the Serviceís community engagement initiatives, crime prevention programs, special events, parades, searches for missing persons and emergency call outs. As an example of Enzo's dedication, he was asked last minute to work at the Ukrainian Festival due to his qualification to drive the command post. He worked a double shift from early Saturday morning till after midnight, in order to drive the command post back to TSV. Following that, Enzo did the same on Sunday morning. In another instance, Enzo used his personal experience with commercial vehicles to work with TSV's Commercial Vehicle Inspection Unit during a City of Toronto Truck Safety Inspection blitz known as Vision 2000. He has also worked alongside TPS officers at community events to promote road safety and has also supported several RIDE Enforcement events. 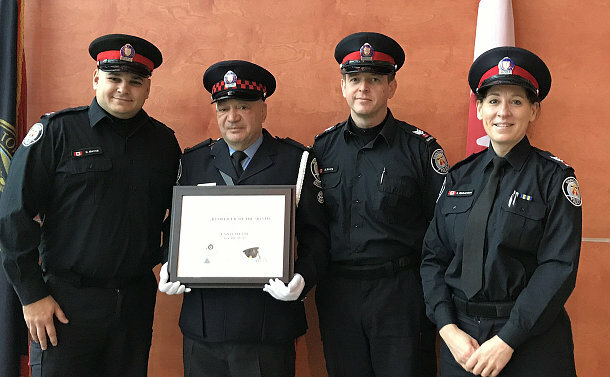 Enzo joined the Auxiliary program in 2000, first at 51 Division, then at 14 Division Substation, 11 Division and finally at TSV. He still remembers fondly his graduation in 2000. In fact, he takes pride in the same Number 1 uniform he was issued 18 years ago and is proud that it still fits him like a glove. He jokes" I cost the service very little money." He has logged over 190 hours in six months. "Being an Auxiliary officer is an enjoyment for me, a way to get out and to give back. I don't mind driving an hour each way from Hamilton because it's a passion for me. I feel honoured to be recognized for doing something I love," Caluori said. If you are looking for a fulfilling and rewarding volunteer career, you may consider becoming an Auxiliary officer by visiting tps.on.ca/careers.